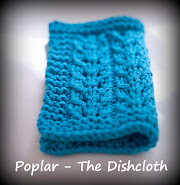 So winter is on its way and knitters are trying to organise their queues and knit up their stashes! There have been a lot of enquiries and orders regarding swifts and sock blockers lately so I thought I'd do a little update as to what's going on with them in the world of Just One W.I.P. We've been on the look out for a long time now for the best materials possible to make our sock blockers in and we've finally sourced some that we're super happy with. 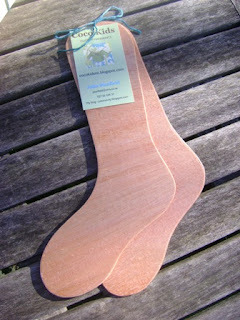 It's a lovely thin kauri ply with a smooth finish on both sides (no snags with those precious hand knitted socks!) that we have sourced from a local supplier. The great news is that at the moment our prices for the new and improved sock blockers are able to stay much the same. That's $15 each, 2 for $28 or 3 for $40. 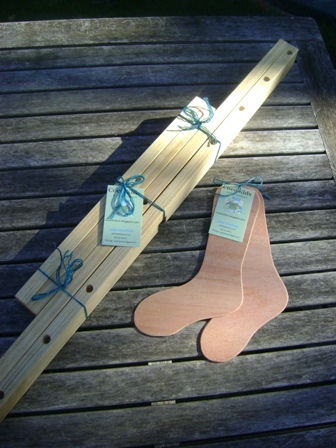 We also offer children's sock blockers in 2 sizes, children's or babies which are $10 each. The kauri ply is a slightly browner more 'biscuity' coloured wood from our previous pine. Blair's swifts are proving so popular that he's making them regularly in the evenings and weekends, currently customers are told there is a 3 week wait when ordering due to the demand. Unfortunately because of the rise in the cost of materials in the last 6 months or so we are having to increase the price of swifts to $60 before postage. 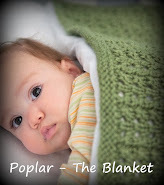 We still think that they are absolutely worth that and are really nicely made large swifts that can handle big skeins. The one below was on it's way to New Plymouth this week to make balling yarn easier for it's owner. Feel free to contact me or leave a comment if you have any questions! I adore my Blair-made-swift. He did a fabulous job, and I reaaly enjoy using it!